Introduction: The caries-preventive effect of pit and fissure sealants was demonstrated in the 1970s and the 1980s with randomized clinical trials using parallel groups or split-mouth designs. In new self-etching (SE) adhesive systems, rinsing and drying steps are eliminated which have made etching easier and have resulted in more patient acceptability. Aim: To evaluate sealant retention, following application of SE adhesive and traditional acid etching (TAE) were carried out among 6–13 years old schoolchildren in Bengaluru city. Materials and Methods: Lower first molars were allotted to either SE adhesive group or TAE group based on lottery method, using a split-mouth technique. The sealants were evaluated for the retention based on modified color coverage caries criteria at the end of 6-month interval by a blinded examiner. Data were analyzed using Wilcoxon tests (P < 0.05). Results: No statistically significant difference was seen in the retention of fissure sealants placed on occlusal surfaces following the use of an SE bonding agent and traditional phosphoric acid etching technique, after 6 months. Conclusions: SE adhesive used for sealing permanent molars of young children for a limited period, should be reviewed every 6 months. Introduction: Tongue cleaning is an important aspect of oral hygiene maintenance along with other mechanical and chemical aids. These methods have an influence on microorganism count in saliva. Aim: To assess the effectiveness of three different oral hygiene techniques on Viridans streptococci. Materials and Methods: This was a randomized controlled trial with 45 study subjects aged between 14 and 16 years and were randomly allocated into three groups: Group A - plastic tongue scraper, Group B - chlorhexidine mouthwash along with plastic tongue scraper, and Group C - chlorhexidine mouthwash. Unstimulated salivary samples were collected on the 1st, 7th, and 15th day before routine oral hygiene practices. Saliva samples were collected and incubated for 48 h on itis Salivarius(MS) agar. Streptococcus mitis, Streptococcus mutans, and Streptococcus salivarius were counted. Data were analyzed using descriptive and inferential statistics. 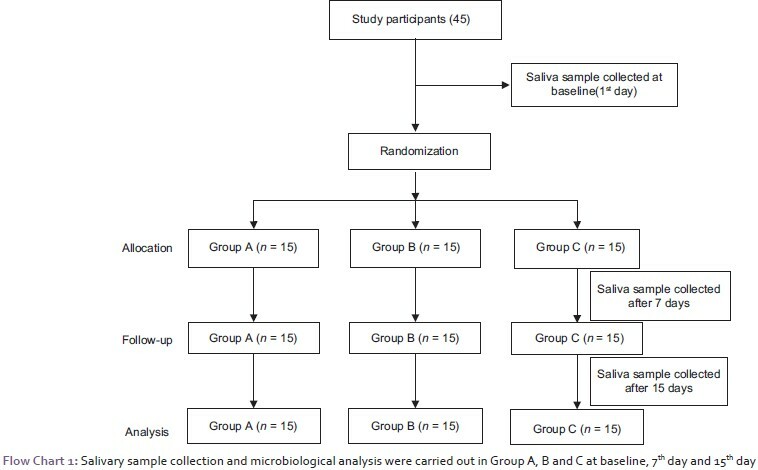 Results: The mean count of S. mitis, S. mutans, and S. salivarius for Group A, B, and C was found to be significant (P < 0.001) when compared between 1st, 7th, and 15th day. Between-groups comparisons revealed a significant difference between Groups A and C, B and C (P < 0.001). Conclusion: There was a significant reduction in bacterial count in all the participants indicating that all the three methods are useful in improving oral hygiene. Combination technique was found to be most effective. Background: Tooth avulsion is one of the most serious dental emergencies in children often occurring in school or during play time in school, therefore, the knowledge and perception of schoolteachers regarding the appropriate measures to be taken immediately after tooth avulsion is crucial to good prognosis. Objective: To assess the knowledge and attitude regarding dental trauma and its management among primary school teachers of Modinagar (Uttar Pradesh) before and after oral health promotional intervention. 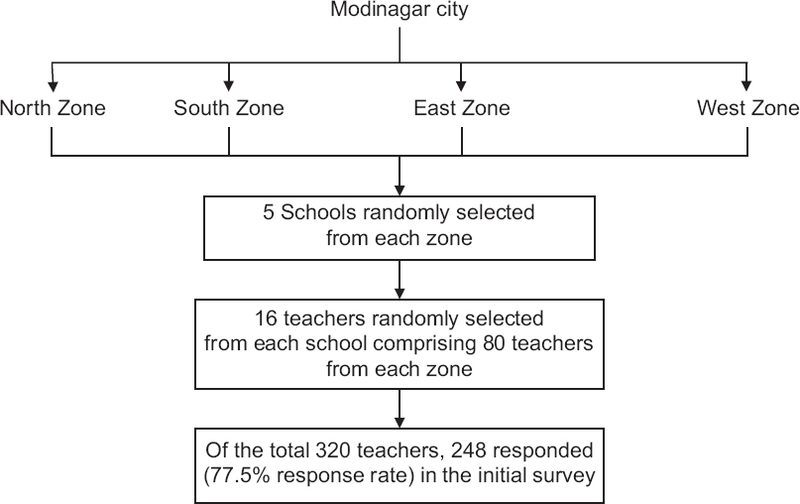 Methodology: A questionnaire based interventional study was done in Modinagar among 248 school teachers and carried out in three phases. In the initial phase, a self-administered structured questionnaire was delivered directly to the respondents. Afterward, an informative 45-min lecture on dental trauma and its management was given during the second phase and in the third phase; a follow-up survey was done to assess the outcome. Statistical analysis was done using Chi-square test with statistical significance at 5%. Results: Insufficient knowledge regarding dental trauma and its management was seen in the preliminary phase, but significant improvement of 90% and above, was observed in follow-up phase after the interventional period (P < 0.0001). Conclusion: The school teacher's level of knowledge on the management of dental trauma appears to be inadequate. This study highlights the importance of the provision of oral health promotion in improving the knowledge regarding management of dental trauma. Introduction: The communication between faculty and students is a vital component of optimal facilitation of knowledge and learning. Various factors influence this dynamic. Aim: To assess communication levels between students and teachers in a dental college scenario via focus group discussion. Materials and Methods: The focus group discussion consisted of 10 groups; 5 groups representing the teachers, and 5 groups representing the students. Each group consisted of 6 participants. Hence there were a total of 30 teacher and 30 student participants. Focus group discussion was conducted for each of the groups for 30–45 min duration in the presence of a moderator and a note-taker. Open-ended questions were put across by the moderator to initiate and continue the discussions. The hand-written data taken by the note-taker were transcribed onto a computer on the same day of the discussion. Based on the transcription, domains were created for the student and teacher groups. Results: The issues raised by both the teacher and student groups in this focus group discussion were broadly classified into the following themes: (1) Past versus current scenario, (2) attitudes toward communication and learning, (3) hindrances to effective communication, and (4) potential solutions. Conclusions: Focus group discussion exposed many differences in the perceptions of teachers and students to communication. Each group, however, felt that bridging the teacher-student communication barrier was crucial to improve the teaching-learning experience. Many constructive solutions were provided by both the groups which can help to improve the quality of teaching-learning experience resulting in better quality of education. 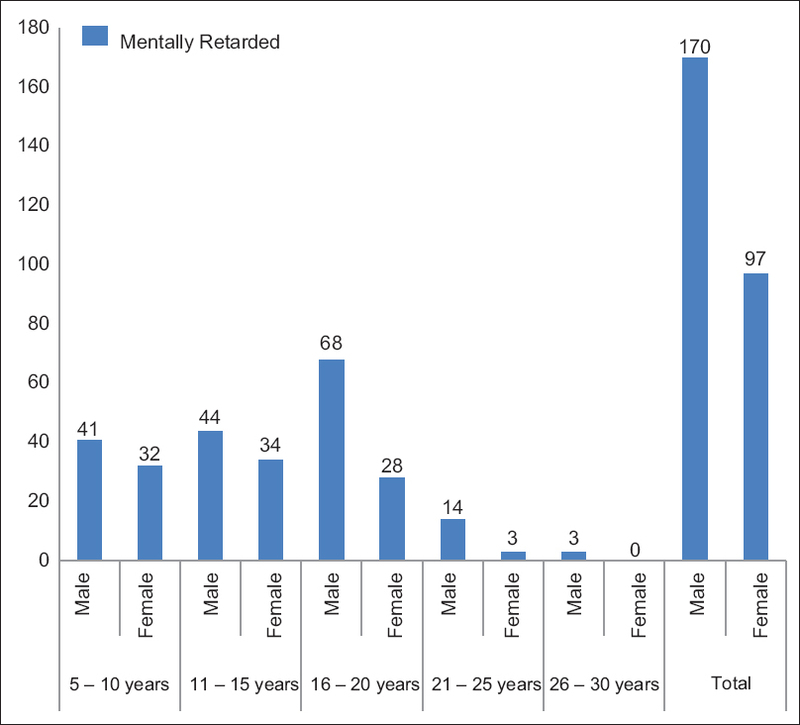 Introduction: Oral health of the mentally retarded (MR) has received scant attention in the literature compared with the normal child even though they are much sufferer. Aim: To assess the impact of various sociodemographic factors on oral hygiene of MR subjects of Bhopal city. Materials and Methods: A descriptive cross-sectional study was conducted among 267 MR subjects enrolled at various institutions of Bhopal city. A pretested proforma was used to record information about demographic data, socioeconomic status, the intelligent quotient of inmates, type of mental retardation, and dietary habits. The clinical examination was done to evaluate oral hygiene of subjects using oral hygiene index-simplified (OHI-S). Descriptive statistics, Student's t-test, analysis of variance and multiple linear regression analysis was applied using Statistical Package for Social Sciences (SPSS) software. Results: The mean OHI-S of MR was found out to be 2.51. Male had mean OHI-S of 2.95 while female had 1.65. Noninstitutionalized had poorer oral hygiene with mean OHI-S of 3.2. According to the degree of mental retardation, profound had the highest OHI-S score, i.e. 3.71 while mild had the lowest score, i.e. 1.01. Introduction: Genetics play an important role in the determination of palmer dermatoglyphics. Oral submucous fibrosis (OSMF) in India is high due to excess consumption of areca nut. Hereditary and environmental factors causing OSMF may lead to peculiarities in the dermatoglyphic patterns. Dermatoglyphics can identify the disease at the earliest, and preventive measures can be instituted for subjects having OSMF. Aims: To assess the dermatoglyphic pattern of subjects with OSMF and to compare it with that of the control group. Materials and Methods: This cross-sectional study was conducted among patients 15 years and older visiting the Outpatient Department of a dental institute. They were selected based on predefined inclusion and exclusion criteria. The sample size was determined using G*Power software. The sample size thus determined was 39 which was rounded off to 40, thus 20 subjects were allotted to each group. The dermatoglyphic pattern of both hands of the study and control group was obtained using a special standard ink method. The dermatoglyphic patterns were analyzed qualitatively for loops, arches and whorls. Chi-square test was used to determine the difference in dermatoglyphic patterns of the two groups. Results: The percentage of whorls in study groups was 24% and 20% in the right and left hand respectively, as compared to 7% and 5% in controls group. The percentage of arches in study group was 0% and 1% in the right and left hand respectively as compared to 8% and 7% in control group. These differences were found to be statistically significant (P < 0.05). Conclusions: Difference between the percentage of arches and whorls of the two groups was found to be significant suggesting that dermatoglyphics could be used as a genetic marker for determining susceptibility toward OSMF. Introduction: Among people living with human immunodeficiency virus/acquired immunodeficiency syndrome (HIV/AIDS), studies shows variations in the prevalence of oral manifestations which may be attributed to differences in prescribed medications, stages of disease, way of transmission, and inadequate diet. Aim: To assess the dental caries experience, periodontal status, and oral mucosal lesions among people living with HIV/AIDS. Materials and Methods: A cross-sectional study was conducted for a period of 2 months among 130 people above the age group of 15 years, having HIV/AIDS. Oral mucosal lesions were assessed according to the World Health Organization Oral Health Assessment Form 1997; dental caries was assessed using decayed, missing, and filled teeth (DMFT) index and periodontal status was assessed using community periodontal index of treatment needs index by a single calibrated examiner. Data on antiretroviral therapy (ART) were obtained from medical records. The data were analyzed using SPSS version 16. Level of significance was set at 0.05. Results: Majority of them were females (84.6%), and 86.2% were on ART. There was no significant difference in the DMFT score among subjects with and without ART (median = 3). Fisher's exact test did not show statistically significant difference in the periodontal status between people with or without ART. Hyperpigmentation was found in 12.5% of the study subjects with ART. Conclusions: Subjects with and without ART did not show any difference in the prevalence of dental caries or periodontal status. Hyperpigmentation was the common condition found among subjects with ART. However, further follow-up studies are required to gain insight to the long-term use of ART on oral tissues. Introduction: Individual perception of malocclusion may vary from the clinician's point of view. Assessment of individual perception of malocclusion is important for treatment planning, priority setting, allocation of resources, as well as for patient education and motivation. Aim: To assess the perceptions of orthodontic treatment needs of school children and to find out the correlation, if any, between the subjective treatment need perceived by children and the objective need. Materials and Methods: The study was conducted among school children of South Bengaluru aged 9–18 years. The study was cross-sectional in design, and a convenience sampling method was adopted. The clinical examination was conducted using the Index of Orthodontic Treatment Need (IOTN) modified for use in epidemiological surveys (Modified IOTN). Chi-square/Fisher's exact test has been used to find the significance of study variables at 5% level of significance. Results: Among the participated children, 21% needed orthodontic treatment and among 79% of children there was no need for treatment according to the Dental Health Component (DHC) of the IOTN. There was a significant correlation between the subjective need for treatment and the IOTN-DHC. Conclusions: There exists a significant correlation between the subjective need for orthodontic treatment assessed using the index and the objective need perceived by the patient. Hence, it is necessary to evaluate the perceptions of subjects before beginning of any treatment planning to meet the expectations of patients in general as it is the patient who gains satisfaction from treatment. Introduction: Malocclusion is a developmental condition signifying a mal-relationship between the arches. It is classified into several types and manifest variably from person to person. Aim: To evaluate the severity of the malocclusion and orthodontic treatment needs in 16–24-year-old Indian young adults. Materials and Methods: A cross-sectional study was conducted among 660 subjects (352 males; 308 females) residing in rural areas of Dehradun, India. Clinical examinations were conducted using the dental esthetic index (DAI) to evaluate the extent of orthodontic treatment needs among the population. Results: The mean DAI score of the sample was found to be 31.08 ± 7.98. No gender-wise differences were found. Statistically significant differences were observed between the age groups. Diastema between males and females was the only component where differences were found to be statistically significant. Conclusion: Around 45.15% of the total sample had a highly desirable and mandatory orthodontic treatment need. Gender did not influence treatment need whereas age group was found to influence it. Introduction: Work-related musculoskeletal disorders are problems of the musculoskeletal system that significantly cost workplace problems thus affecting occupational health, productivity, and career of the working population. Dentists are prone to many work related occupational hazards. Aim: To assess the prevalence and distribution of symptoms of MSD among postgraduates and faculties attached to dental colleges in Bengaluru city. 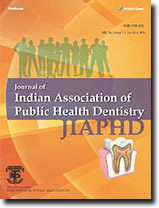 Materials and Methods: A cross-sectional study was conducted among all the postgraduate students and faculties working in various dental colleges of Bengaluru city, India. A self-administered questionnaire was used for recording demographic data and to collect information related to musculoskeletal symptoms and the location of musculoskeletal pain among dentists in Bengaluru city. The data were collected compiled and analyzed using SPSS software version 21. Descriptive statistics was done. The findings were compared across study subjects using Chi-square test and Spearman correlation. Results: The prevalence of MSD among males was 40.25% and females were 59.75% and this difference was statistically significant (P = 0.03). The symptoms were higher in dentists practicing for more than 10 years. Lower back pain and shoulder pain were the most commonly reported complaints by dentists. The prevalence of musculoskeletal pain was 41.35% for dentists in the age group of 26–30 years. The frequency of musculoskeletal pain among female dentists was nearly double that of males (P = 0.009). Conclusion: This study suggests that dentists in Bengaluru do experience a certain amount of occupation-related health problems. 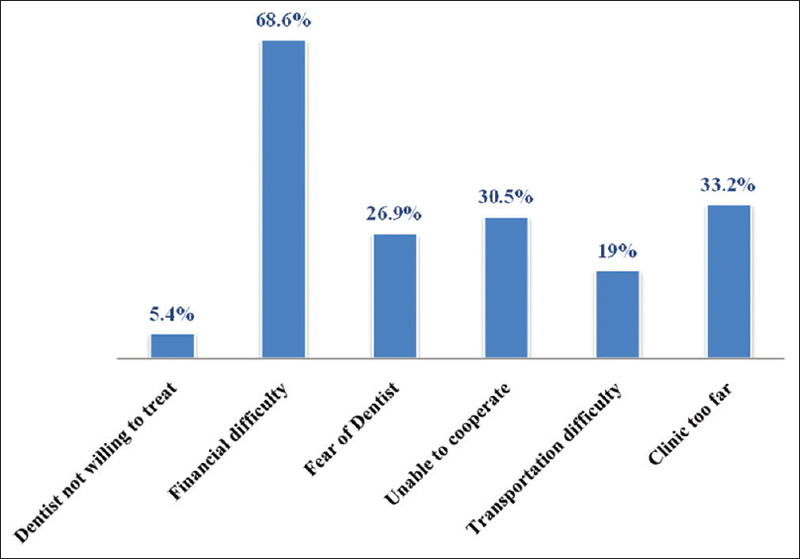 The study found overall high prevalence of musculoskeletal symptoms (64%) among dentists in Bengaluru city. Introduction: In this era of scientific advancement, research is vital and forms the heart of the knowledge expansion. Dentistry is one the fastest evolving branches of science in today's world and needless to say, it is centered on research. In India, research is a part of postgraduate curriculum. Many research works are conducted by postgraduates as a necessity, but very few do it with actual interest. Hence, in this study, we plan to conduct a survey on the awareness of dentists toward research in Telangana region. Aim: To assess the knowledge and highlight the need to learn research methodology for dentists in Telangana region. Materials and Methods: A cross-sectional questionnaire study was conducted with 15 close-ended questions to know different ideologies among dentists for planning a research and to correlate opinions from dentists of various regions of Telangana state. A total of 115 participants took part in the study. They gave their consent for the study and gave their opinions with their free will. We categorized our results according to the designation of the participants and the answers that were given for each question. Statistical analysis was performed using SPSS version 22. Results: A statistically significant difference (P < 0.05) of opinions was obtained with regards to the type of study that was preferred, type of analysis that was done, and obtaining a statistically significant value for their results. Conclusion: There is considerable variation when it comes to planning minor steps of study with few basics being overlooked. There is a need for establishing a standardized protocol for planning a study. Introduction: Poor oral health can have a profound effect on the quality of life. The experience of pain, endurance of dental abscesses, problems with eating and chewing, embarrassment about the shape of teeth or about missing, discolored or damaged teeth can adversely affect people's daily lives and well-being. 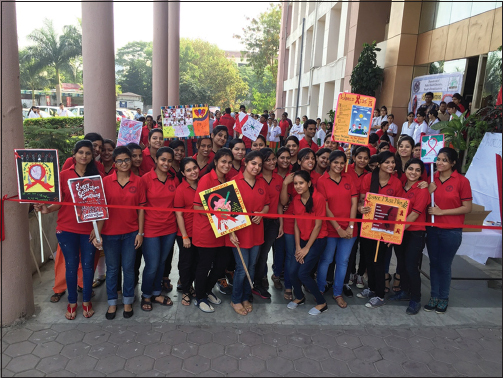 Aim: To assess the knowledge, attitude, and practices of oral hygiene among college students in Bengaluru city. 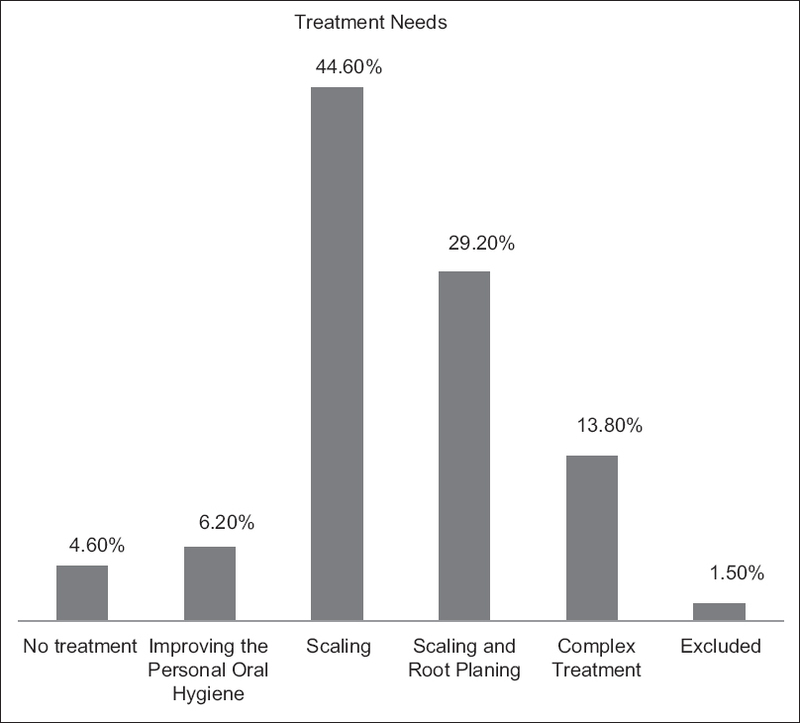 Materials and Methods: A descriptive cross-sectional survey was conducted using a self-administered 21-item structured questionnaire that assessed oral health and hygiene knowledge, attitudes, and practices of 499 students from various professions. 202 engineering students, 99 MBA/BBM students, 99 nursing students, and 99 students from B.Com. The study was conducted during June and July 2013. The results were analyzed by descriptive statistics and Chi-square test using SPSS version 14. All tests were set at a 0.05 significance level. Results: The toothbrush with toothpaste is the most common oral hygiene aid used for cleaning teeth, which was adopted by 304 (60.9%) students. More than half 287 (57.5) of the students felt that dental caries affected their esthetics. 358 (71.7) students felt that the health of the mouth and dentition had an impact on the health of the body. Conclusion: The toothbrush with toothpaste is the most common oral hygiene aid used for cleaning teeth; it was observed that a greater number of students brushed their teeth in the morning. Dental pain was the main reason to visit a dentist. Introduction: Latest theories regarding the rationale of carious dentin removal are beginning to question the amount of tissue that needs to be excavated to successfully treat a carious tooth. It is not always easy to make a decision at which point to stop excavation because there is an apparent lack of objective clinical markers. However, hardness of dentin might be a useful marker in this respect. Nanoindentation test is a variety of indentation hardness test applied to small volumes such as teeth which contain nanosized structures. Aims: To compare and evaluate the nanohardness of dentin after chemomechanical (Carie-care) method of caries removal with the conventional (rotary instrument) method of caries removal in primary and permanent teeth using nanoindenter. 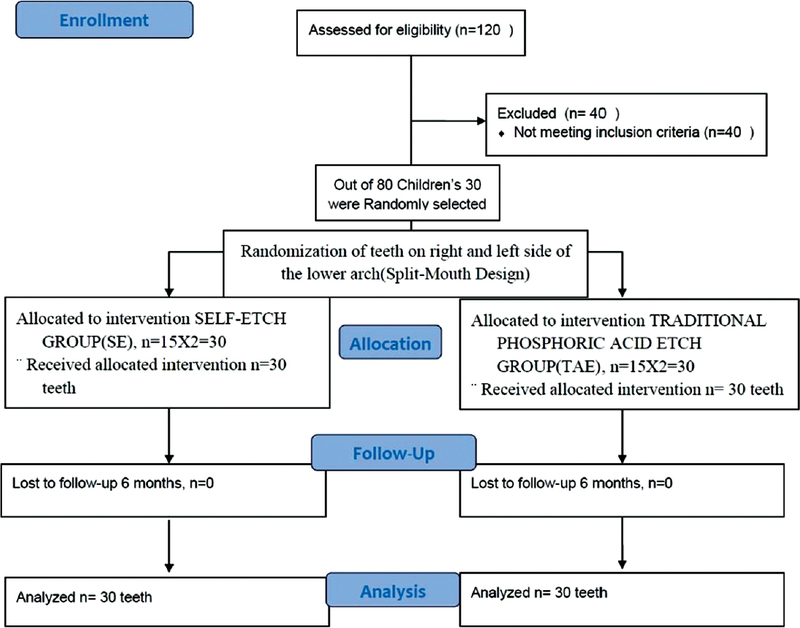 Materials and Methods: An in vitro randomized controlled trial was conducted using fifteen primary and fifteen permanent extracted molars with active carious lesion extending into the dentin. The primary and permanent molars were further randomly divided into two subgroups by sectioning the samples into two halves. Caries removal was done using conventional drill (CD) and chemomechanical caries removal (CMCR) (Carie-care) methods. 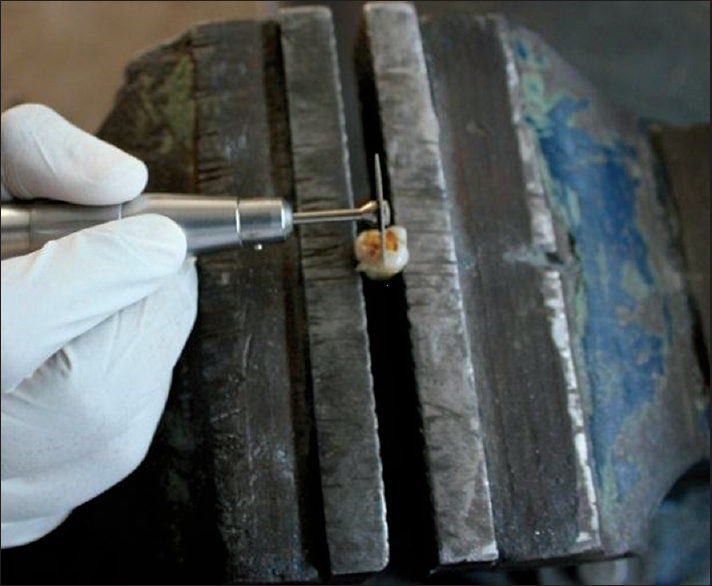 Following the caries removal, the test specimens were subjected for evaluation of nanohardness of dentin using nanoindenter. Student's t-test, analysis of variance, and Bonferroni test were used. Results: Statistically significant difference between the 4 groups with a P < 0.05 was obtained. Conclusions: After caries removal, the hardness of remaining dentin was found to be harder after CMCR method than with the CD method in both primary and permanent teeth, and the remaining dentin of the permanent teeth was found to be harder than the primary teeth after caries removal.